Picture of the beautiful VegetableYarden. I was going to title this post, "Food Security in the Age of the Supermarket" but that sounded too boring and uppity. 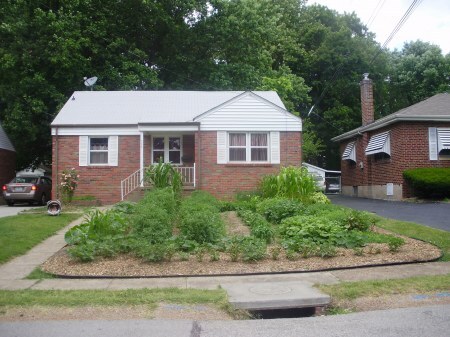 "VegetableYarden in Ferguson, Missouri" is a much better title and, I must admit, stolen from the intertubes. I stole it because it's beautiful in its simplicity but also disguises an issue that tends to be ignored, even by the most cognizant among us. VegetableYarden in Ferguson, MO is a blog about a man and his family and their attempts to grow heirloom vegetables in their front yard instead of grass. The concept seems simple right? Grow fresh vegetables full of nutrients and without pesticides and serve it up to the family. But that's not the way the folks in Ferguson, see it. They see something different in that front yard. Something different than green grass, immaculately manicured, watered, and if you have some extra cash, herbicides sprayed on it so it looks like supernatural golf course grass that is soft, fuzzy, and a little bit creepy. They see something out of the ordinary. Woah. When did gardens become peculiar and when did green grass become the norm, I say. Oh. It's a garden in the front yard that is peculiar, you say. What's the matter with a vegetable garden in the front yard, I say. It's peculiar because I have to drive by every day and look at it and it feels different, you say. But our differences are what makes up America, I say. Different means a decrease in property values, you say. Ahh, I see. So, we are more concerned with making a buck and keeping things status quo than we are with learning how to grow something with our bare hands to feed our families? We'd rather make a buck and continue to count on supermarkets with produce ripening in dark semis and processed boxes of frozen food made with ingredients that I can't even pronounce and made who knows where? To me that's insane and a dependency that makes me feel uncomfortable. That's why I stand in solidarity with VegetableYarden in Ferguson, Missouri. He's teaching us, through his fight with local government, that to be at the mercy of the local supermarket for your food is a dumb and shortsighted way of living. He's teaching us that to lose the ability to grow your own food anywhere on your property is a dumb and shortsighted way of living. And finally he's teaching us that we are losing sight of the connection between humans and nature. I think it's time we all carve out a plot in our front yards and grow some vegetables. Are you with us? I just happened to come across your site this evening. Thank you for the support, and the wonderful writing you offered on our endeavor. There are a few new posts and updates on the site if you'd like to check back on it. The situation is still ongoing, and we appreciate so much what people like you have done for us. It was my pleasure. I've been contemplating a vegetable garden in my front yard for some time now, and you've given me the courage to get the process rolling. Thanks for fighting the good fight and inspiring others to look at things from a different perspective.